Your story and its conflict officially ended with your climax. Conceivably, you could end your story right then and there. But most books need an extra scene or two to tie off any leftover loose ends and, just as importantly, to guide your readers to the emotion with which you want to leave them. Like those great “ensemble” scenes at ends of the Star Wars movies, this is the last glimpse your readers will have of your story world and your characters. So make it one they’ll remember! extra scene for no other reason than the opportunity to spend just a little more time with these characters they’ve grown to love. dogged pursuit, while both Mal and Inara and Simon and Kaylee take a step into their future relationships together. The resolution is not just the ending of this story, but also the beginning of the story the characters will live after the reader has closed the back cover. It performs its two greatest duties in capping the current story, while still promising a sense of continuing life from the characters. This is true of standalone books and even truer of individual parts in an ongoing series. The standalone book Empire of the Sun by J.G. Ballard ends with a few short scenes explaining Jamie’s adjustment to his post-war life outside of the Japanese POW camp and hints at his near future growing up in England. Ship of Magic, the first book in Robin Hobb’s The Liveship Traders series, is even more open-ended: its resolution promises that protagonist Althea Vestritt will pursue and rescue her liveship Vivacia, which has been captured by pirates. Where does the resolution belong? The resolution comprises the very end of your book. This is it, folks! After this, there ain’t no more! The resolution begins directly after the climax and continues until the last page. Resolutions can vary in length, but, generally speaking, shorter is better. Your story is already essentially over, so you don’t want to try readers’ patience by wasting their time or stunt their sense of the story by tying off every loose end too perfectly. The length of your resolution will depend on a couple of factors, the most important being the number of remaining loose ends. Optimally, you will have used the scenes leading up to your climax to tie off as many ends as possible, which will free up your resolution to take care of only the essentials. of happiness, hope, and affirmation. Books, of course, don’t have the advantage of being able to end with emotionally resonant music. But we should still strive to leave readers with a similarly powerful and memorable scene. How do masterful authors and directors frame their final scenes to tie off all the loose ends and leave readers with an emotionally powerful scene? Let’s take one final look at how our four stories pull it off. Pride & Prejudice by Jane Austen (1813): After the climax in which Darcy and Lizzy proclaim their love for one another, Austen ties up her loose ends in a few neat scenes, which include the Bennets’ reaction to their engagement. From her perch as an omniscient and distant narrator, Austen then caps her story with a final witty scene in which she covers the book’s two culminating weddings and comments on Mr. and Mrs. Darcy’s and Mr. and Mrs. Bingley’s future lives together. Her final scene is a beautiful example of hitting a tone that sums up the story as a whole and leaves the reader feeling exactly how the author wants them to. angel Clarence has finally gotten his wings. This is a tour de force of an emotionally resonant closing scene that leaves readers wanting more while still fulfilling their every desire for the characters. what essentially amounts to both an epilogue, explaining some of Ender’s life after his defeat of the Formics (he leaves Earth to try to make peace with both his superstar status and his guilt over his xenocide of the aliens), and an introduction to the books that will follow in the series (in which Ender takes charge of finding a new home for the sole remaining Formic cocoon). Master and Commander: The Far Side of the World directed by Peter Weir (2004): In this movie, we find perhaps the least resolved of all our resolutions. Whether the movie was angling for a sequel (as its subtitle suggests) or just paying tribute to the continuing nature of its source material, the Aubrey/Maturin series by Patrick O’Brian, it still works on every level. After tying off all existing loose ends from its plot’s overarching conflict, it ends with a surprising scene in which Jack realizes the Acheron’s captain wasn’t dead as he supposed, but instead masquerading as the ship’s surgeon in order to attempt a takeover of the ship once it sailed away from the Surprise. The final scene, in which Jack orders his ship to change course and pursue the Acheron, while he and Stephen continue to play their rousing duet, gives us both a definite sense of continuation and a perfect summation of the movie’s tone. What final lessons can we learn from our exemplary books and movies? What do they teach us about ending our stories on just the right note to satisfy our readers, while still leaving them with that bittersweet feeling of wanting more even as they realize they’ve had just the perfect amount? 1. The resolution takes place directly after the climax and is the last scene(s) in the book. 2. The resolution must tie off all prominent loose ends, leaving the reader without any salient questions. However, it must also avoid being too pat. 3. The resolution needs to offer the reader a sense of continuation in the lives of the characters. Even a standalone book should hint at the life the characters will lead after the reader has closed the back cover. 4. The resolution should give the reader a concrete example of how the character’s journey has changed him. If he was a selfish jerk at the beginning of the story, the resolution needs to definitively demonstrate his change of heart. 5. Finally, the resolution should strike an emotional note that resonates with the tone of the book as a whole (funny, romantic, melancholy, etc.) and leaves the reader completely satisfied. Congratulations! 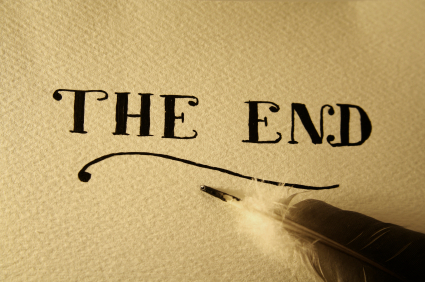 You’ve just completed the monumental task of writing a book. And not just a book, but one that is structured to excite and satisfy readers with its rise and flow of action, reaction, suspense, and revelation. As you write your closing lines, consider all the words that have come before and cap them off with an intellectual and emotional home run of a resolution! Stay tuned: Next week, I’ll be concluding the series with a post answering Frequently Asked Questions about structure. Tell me your opinion: How many scenes does your resolution contain? Writing ultimately has to be a balance between our creative right brains and logical left brains – between art and craft. Harnessing inspiration and going with the flow is important, since that deep subconscious well is often where we find our best ideas. But we also have to be able to step back and look at them analytically and trim and add to make sure the ideas maintain proper structure. Some writers let everything flow out during one stage (the outline or the first draft), then retreat to the objective distance of logical analysis during revision. Personally, I find my best productivity in a constant check and balance between creativity and logic.